Bus stops A and B are located on Ebbsfleet station grounds and within walking distance of the entrance to Ebbsfleet station. Buses to Ebbsfleet from depart from Greenhithe Railway station. Gravesend connected by high-speed rail (�2.00 single, �3.00 return). All Fastrack B services call at Ebbsfleet International. Buses stop every 10 minutes in both dircetions during peak hours. The adult fare for any single journey that starts prior to 7am is charged at �2.20. High-tech bus stop information points have been installed with interactive screens to provide a journey planner, news, real-time train departure information and real-time bus journey times. Dedicated allow record jurney times, the bus-way's are set up throughout Ebbsfleet, Northfleet, Dartford and Gravesend to speed up your journey and improve reliability. Bus journey time between Ebbsfleet and Bluewater is about 15 - 18 mins on average. Bus journey time between Ebbsfleet and Gravesend is about 7 - 10 mins on average, rail takes 2 minutes. Journey time between Ebbsfleet and Dartford is about 25 - 30 mins on average. An M-ticket payment system is in operation, a scheme designed to speed up ticket purchase by SMS / mobile Text service, takes payment from your phone. You need to register by texting REG to the shortcode 82500. 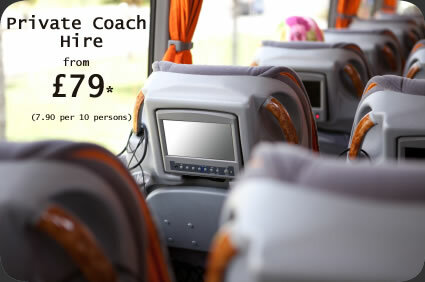 Groups of more than 8 people should consider private coach hire. Ebbsfleet has excellent access to bus and coach services. Arriva and Fastrack provide bus services to Ebbsfleet International Station.